This guide will discuss how to activate an ACF PRO license and unlock plugin updates. Without a valid activation for your website, ACF PRO will not be able to receive plugin updates, however, all other plugin features will continue to work correctly – good for development or staging websites. Each ACF PRO order generates a unique license key that is associated with your ACF account (created during checkout). You will find your license key by logging in to your online account and viewing your available licenses. You can also view and manage your activations from this page! 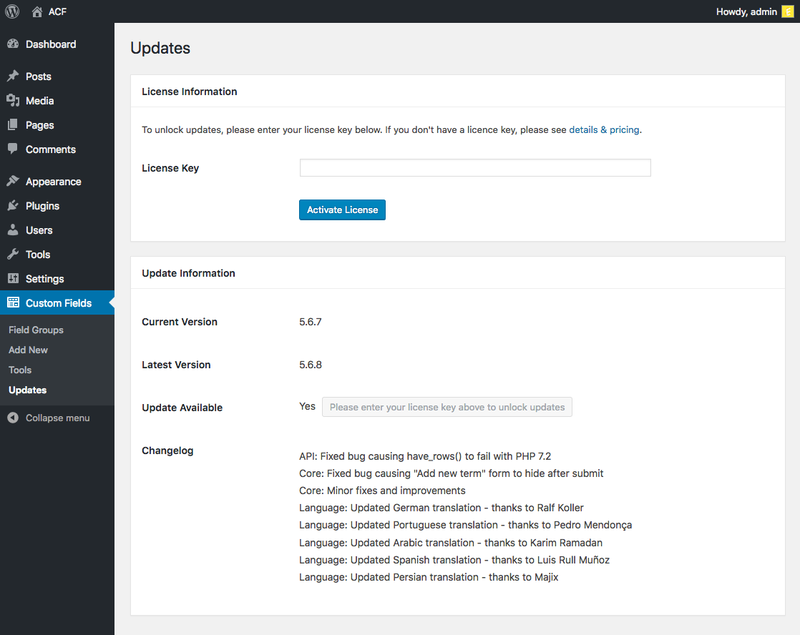 To activate your license, log in to your WordPress admin and navigate to the Custom Fields > Updates page. If this page is not available, please check that you have activated the ACF PRO plugin (and deactivated the free one) or contact support for help. On this page, paste your license key into the input field and click the Activate button. Once the page reloads, you will be met with a success notification and your website will now receive ACF PRO plugin updates! In the case of an error, please contact support and provide the error message displayed (along with your info). When copying and pasting your license key, please make sure to copy all characters. License keys do not contain spaces, but contain both lowercase and uppercase letters, numbers and special characters.